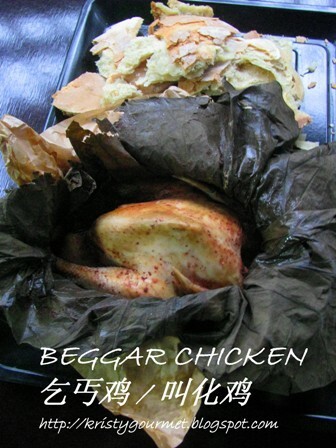 I think anyone from Asian should have heard of this delicious dish called beggar chicken. One of the legendary dish originated from Jiangsu, during Qing Dynasty. Click here to read more of the legendary story. However, there are actually quite a number of versions for this particular dish these days. For my personal opinion, since this is a dish made by a beggar, then it should be something simple without any complicated ingredients. Please read on to find out more. And here's what I have decided to put into the chicken. 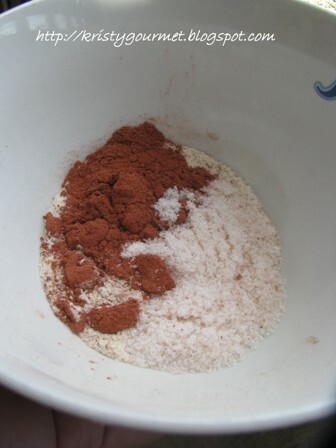 My special spice mixed ingredients included 1 tspn five spice powder, 1 tspn dang gui powder, 1 tspn fine salt, 1/2 tspn pepper & 1 tspn vegetarian granule. 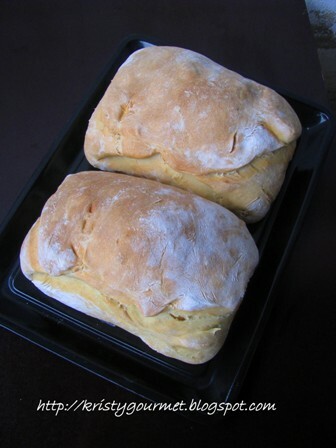 **I used 1 kg flour mixed with 600ml water (but too thick for small bird). So, I suggested the above given measurement. 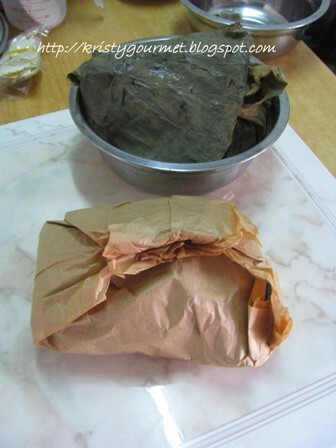 (1) soak lotus leaf for about 2 hours or till totally softened then washed & pat dry. On the other hand, soak dang gui slices into brandy or rice wine. (2) marinade chicken with the ready mixed spice then set aside to rest for an hour at room temperature. 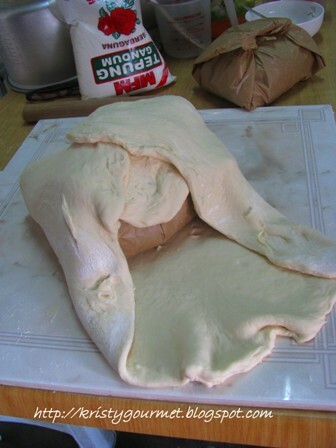 (3) at time being, stir water into flour till soft dough is formed and knead till smooth. 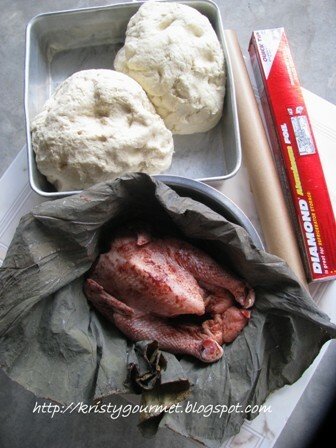 (4) when ready, wrap chicken with lotus leaf then follow by the second wrap, with greaseproof paper. 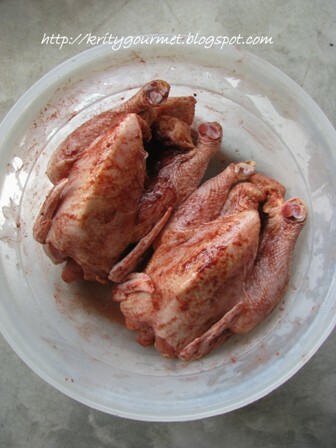 (as picture shown below) Of course, don't forget to add in the Chinese wine mixture into the chicken core. 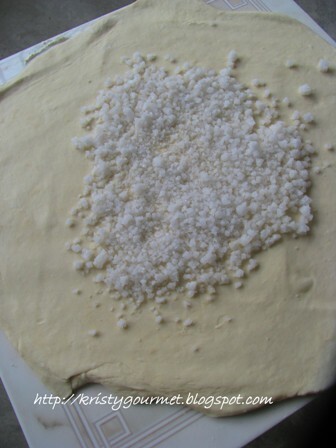 (6) after flatten dough into thin sheet, place coarse salt onto center. 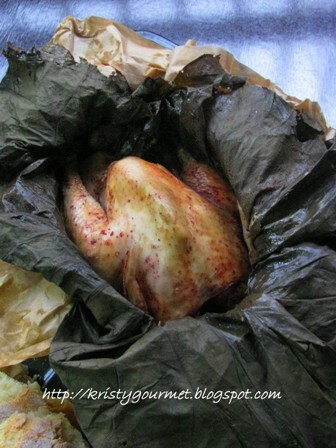 (7) place in the nicely wrapped chicken and fold in dough to seal the chicken. (8) finally, bake at preheated oven 200'C for an hour and 180'C for another hour, but mine I baked at 220'C for the first 60 minutes then 200'C for the following 60 minutes. 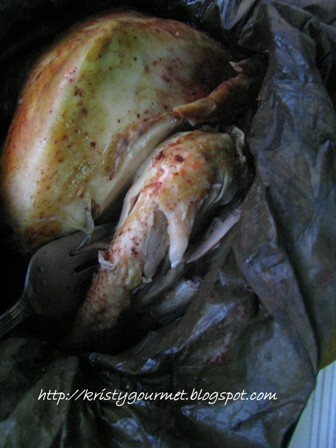 And finally, here's the homemade beggar chicken from kristygourmet kitchen ! Super exciting. As I mentioned the dough is too thick, so it doesn't cracked as it was told. haha..... Ok Ok... its my fault ! Don't blame anyone ! 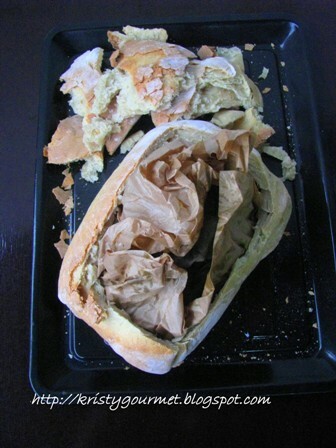 Anyway, I cut it open and the whole thing smells soooo good. The chicken is so aromatic, juicy, moist & really really tender that the meat is almost slips off the bones.Yup, it is all true ! Its all worth it. I definitely will go for another attempt soon. Hope you guys will love it too ! Cool that you even made this classic at home! You are simply the best! This is a great place organize an event; they have great staff and great events put on here! I had nothing but great times and great conversations at Seattle venues here. They served slider and shrimp cakes as appetizers with chicken skewers, and eggrolls that had veggies on the inside and some kind of creamy fruit sauce on top.